Spaces where vehicles and pedestrians interact and interchange is no more felt than at a busy and bustling industrial estate or business park. In this talk, Jonathan Docksey from wayfinding agency Design JD will explore the different needs of pedestrians and vehicles on industrial estates. He will also explain how the agency engages with users to ensure success. 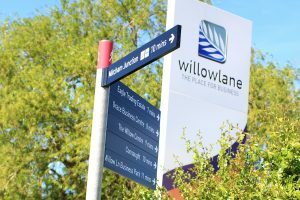 Over the last five years, Design JD have been working on industrial estate wayfinding solutions that ensure a smooth and safe experience for all concerned. Tackling these projects involves taking into account all aspects of the wayfinding journey: from pre-visit information, road signage, and pedestrian signage through to the interaction between people and road traffic. Using case studies, Jonathan will show examples of the agency’s work developing brands for industrial sites, and how this branding has been applied to create unique signage solutions. Jonathan is the Director of Design JD. He studied information design and graphic design at London College of Communication. Over the last 10 years Design JD has developed into a specialist wayfinding consultancy working on projects across the UK. Jonathan has been invited to speak about aspects of wayfinding at events around the world including FESPA (Federation of European Screen Printers Associations) and BPA (British Parking Association). Design JD have just completed a scheme for Manor Royal Business District, the biggest business improvement district (BID) in the UK.